My grandmother was obsessed about my weight. It was as if my body was somehow hers and any extra fat cells were a failure on her part. My first memory of her is an argument she had with my mother about my girth and what she thought they should do about it. Second only to my weight, she hated that I bit my fingernails. It disgusted her that my fingers were always in my mouth and she thought that I would never be a proper lady if I didn’t learn how to stop biting my nails and cuticles. Eight years ago, I became a real estate agent. I donned the full real estate uniform, including the artificial nails. I wore artificial nails for about three or four years. I had those perfect hands that my grandma always wanted me to have and all I had to do was pay 20 bucks every two weeks for them. When I quit real estate, I removed the real estate uniform, including the artificial nails. A funny thing happened, though. My real nails grew. My real nails grew like they had never grown before. I would trim them and look down a week later and they were long again. If a nail broke, I would trim them all the same length to match and within a week or two, I had talons again. I wasn’t manicuring. I wasn’t painting, but after four years of having the hands that my grandma said that I SHOULD have. I had them. WITHOUT EFFORT. Even now, I look down at my hands and my unmanicured nails are longer than I could have ever achieved before. I don’t bite my fingernails anymore. Congrats on not bighting your nails. I understand when I was a teen I had so many people tell me how much or what I should eat. I don’t know what my nails were like when I first stopped biting them. 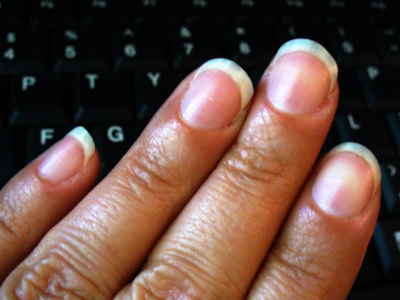 I wore artificial nails for MANY years, covering my real nails, so I have no idea what they were like when I stopped biting them. When I stopped wearing artificial nails, I had gotten a fungus, so I kept them clipped really short until the fungus grew out. Gross, I know, but it happens. It wasn’t until a few months later that I realized that I had completely lost my habit of biting my nails. I have been biting my nails for about ten years, sometimes until I bleed. They hurt because I bite them to the quick. How can I stop? I think that now it is more from habit than from emotional stress.